The dozer blade moves back & forth as the little bulldozer rolls along! There's something special about handcrafted wooden toys that children love and grownups appreciate. Perhaps it is the organic qualities of the wood, or the timeless and simple designs, or the craftsmanship and fascination of watching handcrafted wooden toys in motion (Wow, that's clever! How did they make that?). I've made wooden toys for years. 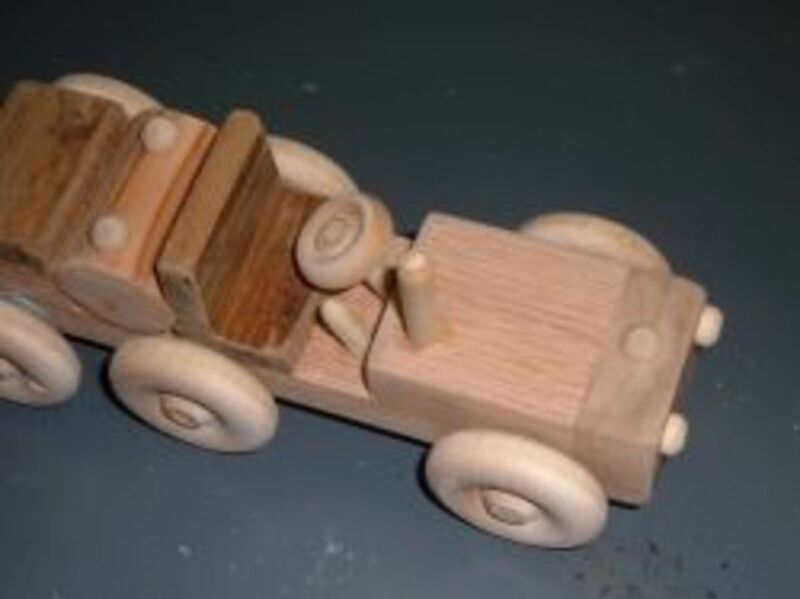 Wooden toy designs can be as simple as a shaped block of wood outfitted with a set of wheels to resemble a car or truck, to puzzles and animated pull toys, or elaborately detailed models. Though some pieces like this bulldozer may look complicated, the woodworking processes are methodical and straightforward. Start with a basic subassembly, and then add the bits of trim to add interest and motion to the toy. Wooden toys can be painted in bright colors, though I typically make toys from figured hardwoods with a hand-rubbed oil finish to highlight the natural colors and grain patterns of the wood. 1" Diameter Wheel: Qty 11/4"
Carefully measure and mark the locations for drilling the axle holes on both edges of the Base (Part A) according to the dimensions in the drawing. Drill the 5/16" diameter holes halfway through from each edge, meeting in the middle of the base. This method helps to ensure that the holes are centered, drilled straight and reduces tear out from the drill bit exiting through the wood. Spread a thin layer of yellow wooding glue to the bottom side of the Hood (Part B) and carefully position the hood in place at the front edge of the Base (Part A). Take care to line up the edges for a clean fit, then use a clamp to hold the pieces in place until the glue sets. Next, glue the Trunk (Part C) to the rear edge of the Base, again taking care to line up the edges for a clean fit. The viscosity of the glue will help hold the trunk in place until you attach the trunk lid and clamp the pieces together. Apply some glue on the backside of the Radiator (Part D) and carefully position the radiator at the front edge of the Base and Hood. Clamp the radiator in position. Add a little glue to the underside of the Trunk Lid (Part D) and then position the Trunk Lid in place on top of the trunk. Clamp both pieces in place until the glue sets.If you have enough clamps continue by gluing the Fuel Tank in place, adding a bead of glue where the tank meets the Base, and again where the tank presses up against the Trunk. Next, glue the Seat (Part G) in place, sliding the seat up against the fuel tank. Glue and position the seat back in place, with a bead of glue along the edge where it meets the Seat, and another bead of glue where the Seat Back (Part H) presses up against the fuel tank. After carefully checking to ensure that each pieces lines up evenly and correctly, clamp the pieces in place until the glue sets.Set the entire Base Assembly aside until the glue dries. Remove the clamps, and give the chassis a thorough sanding. The completed Base Assembly should resemble the Bulldozer chassis in the photo. Dress up the little bulldozer with a few simple details. These only take a few minutes, but the details add a lot of visual interest to the finished toy. I used axle pegs to create headlights, a radiator cap and two filling caps to the fuel tank (two filler caps looked better than just one). It's easier to locate, mark and drill the holes in the chassis for these little details before attaching the wheels. A short piece of 1/4" dowel and a 1" wheel becomes a steering wheel, inserted into a 1/4" hole drilled at an angle wheel the dashboard meets the floor. Another short piece of 1/4" dowel, rounded on one end with a little sanding and with a hole drilled into the chassis at a slight angle, makes a convincing shift level for the dozer blade. Use a thicker 5/8" dowel to make a smokestack. The size and positioning of these little details isn't critical. Just make sure that the scale and placement looks right to you. I measured the location of the headlights and the filler caps, so that they are in line with each other and equal distance from the edges. The radiator cap is centered in the top of the cherry wood radiator. The dozer blade may look complicated but it is really quite simple. 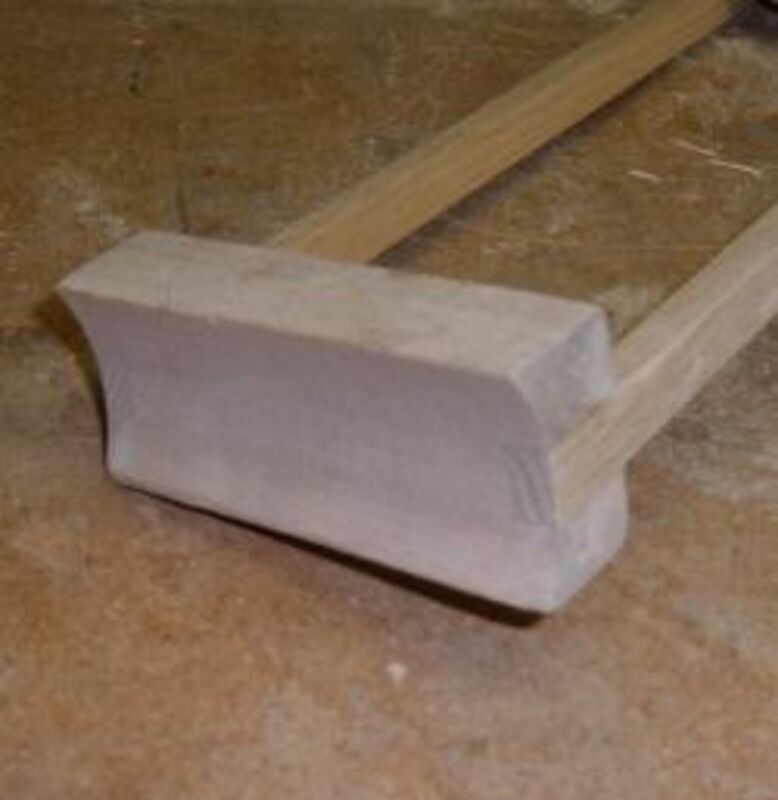 The little notches (called dados) on the side edges of the blade hold the dozer arms in place, and provide a lot of surface area to securely glue the arms to the blade. I used a scrap piece of mahogany for the blade because it is lightweight yet durable, soft enough to sand in the curve of the blade, and it looks good after applying an oil finish. Start by marking the location for the dado notches on the Dozer Blade (Part I). Measure 1/2" down from the top edge on each side of the blade, and this represents the top of the notch. Use the dozer arm to determine the width of the dado by holding the arm along the top line, and draw a sharp line along the bottom of the arm. This define the slot to cut out. 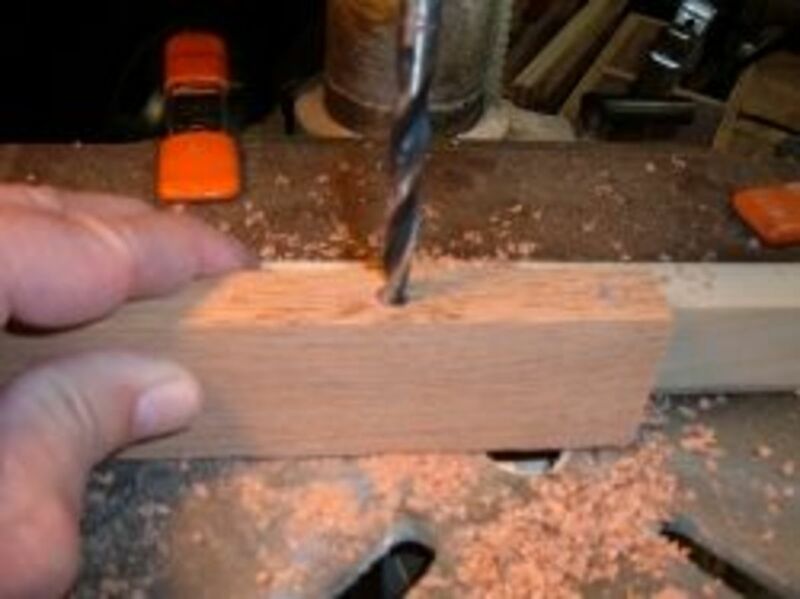 Cut out the little notches (I used a band saw, but a jig saw, table saw or even chisels will work), being careful to stay inside the lines for a tight fit. It is easy to expand the notch a little if the fit is too tight, but a loose fit results in a weak joint that will break. Glue and clamp the arms to the dozer blade. Take care to ensure that the arms are parallel, both at the blade and at the other end (mine are 4 1/4" from outer edge to outer edge). Set the glued assembly aside to dry and cure thoroughly. 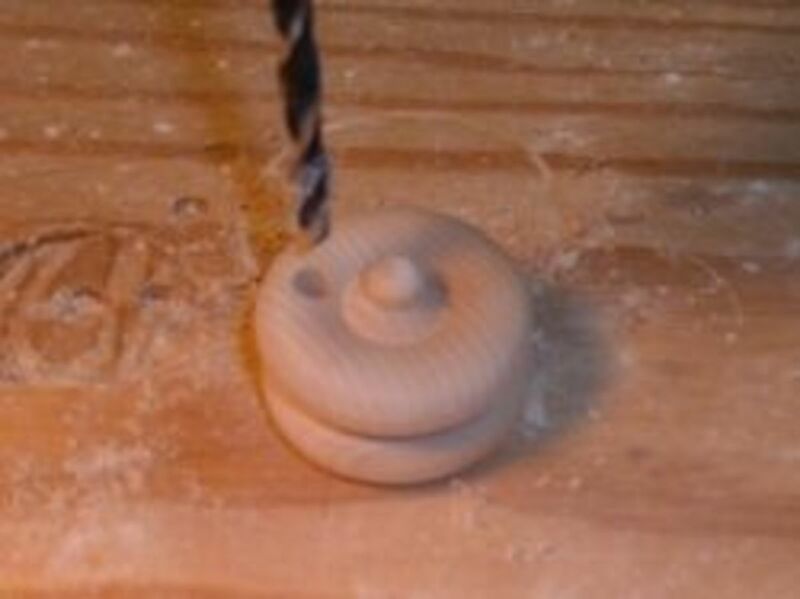 Rounding the curve: I used a drum sander attached to a drill press to create the curved shape of the dozer blade. The sanding drum shaped the wood quickly and easily for a smooth curve. A rasp and sandpaper can produce the same results. The back & forth action of the Dozer Blade (Part I) results from pinning the Dozer Blade Arms (Part J) to the rear wheels. As the Bulldozer is pushed along and the wheels turn, the pinned arms are pushed forward and then pulled back by the rotating wheels. The trick is to line up the holes for the pins accurately so that the Dozer Blade Arms move smoothly and in tandem. Our little bulldozer uses manufactured wood wheels and axel pegs rather than complicated tracks. The wooded wheels are inexpensive and readily available, and they roll really well across the floor. Your little construction engineer won't mind the deviation from a prototypical bulldozer, especially when they see the action of the blade clearing the way across the carpet. If you prefer, you can use a hole saw or band saw to cut out your own wheels. Drill a 1/4" hole through the rear wheels to accept the 1/4" diameter pins for the Dozer Blade assembly. Use a pin to temporarily hold the wheels together. Then mark and drill the 1/4" diameter hole halfway between the center axle hole and the outer edge of the wheel. Glue one end of the front axle to the wheel, taking care to ensure that the end of the axle is flush with the outer edge of the wheel. Slip a washer or the axle, and slide the axle through the Base Assembly. Add another spacer and then glue the other wheel in place. Repeat this process with the wheel and spacers for the second axle (positioned right behind the seat) but leave the rear axle for later. We want to ensure that the Dozer Blade Assembly fits properly and the wheel pins are properly aligned before gluing the last axle in place. Now comes the tricky part: attaching the arms to the rear wheels. The dozer arms and the rear axle were intentionally left a bit long so that they can be cut to the correct length during the final assembly process. Dry fit all of the pieces before applying any glue, and the assembly should go smoothly. Start by sliding the axle into one of the wheel, add a few washer spacers (I used three), then thread the axle through the chassis. Add more spacers and then attached the other wheel, lining up the holes towards the back of the dozer. The extra spacers hold the rear wheels out further from the body than the other wheel sets, allowing the dozer blade arm to pass freely without binding. With the holes oriented towards the rear of the dozer represents the furthest backward movement of the blade assembly as it pivots while the wheels rotate. Position the blade assemble so that there is about 1/4" gap between the back of the blade and the front of the radiator. Now on the dozer arm, mark the location where the arm lines up with the holes on the rear wheel. Drill the holes, round over the cut edges with sandpaper and we're ready for a test fit. Insert an axle peg through the dozer arm and into the hole on the wheel. Mark and trim the length of the pegs flush with the inside edge of the wheel to prevent binding as the wheel rotates.Give the little toy a push. The dozer should roll easily, with the blade pushing ahead and pulling back as the wheels rotate. Don't panic if the arms bind or do not rotate smoothly. Just re-check and re-measure the position of each hole in the blade assembly to make sure that everything is "square" and lines up properly. If you need to move the location of a hole, cut a small piece of dowel to fill the hole and glue it into place. After the glue dries completely, mark the new location and drill the new hole. Then install the pegs, and no one will ever notice! Once you're satisfied with the operation of the bulldozer, remove the pegs and wheels to apply a little glue. Then carefully reassemble the dozer and test the toy again. Make any final adjustments to the alignment before the glue starts to cure.Important: use only a small amount of glue on the pegs that attach the dozer arms to the rear wheel. Glue the peg securely to the dozer arm, but the tip of the peg needs to ride freely inside the the hole drilled in the wheel as it rotates. If you glue this peg to the rear wheel, the toy will bind as you try to push it. Sand the bulldozer thoroughly to round over all of the sharp corners and edges. A thorough sanding removes any rough spots and also opens the pores of the wood to allow the finish to absorb better, producing a rich and smooth finish. There are several non-toxic and child-safe wood finishes available. I prefer applying several coats of Danish Oil, which really brings out the color and grain pattern of the different hardwoods. 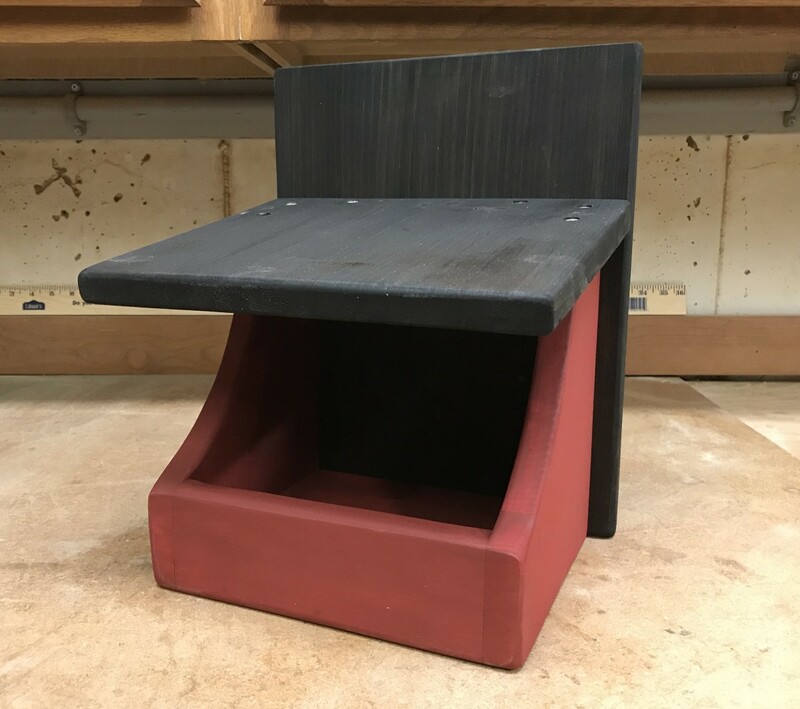 A bees wax mixture is another good option, and the video below provides step by step instructions on how to prepare this version of the finish. Don't forget to sign the bottom of your new wooden toy bulldozer, and include the date (or year). 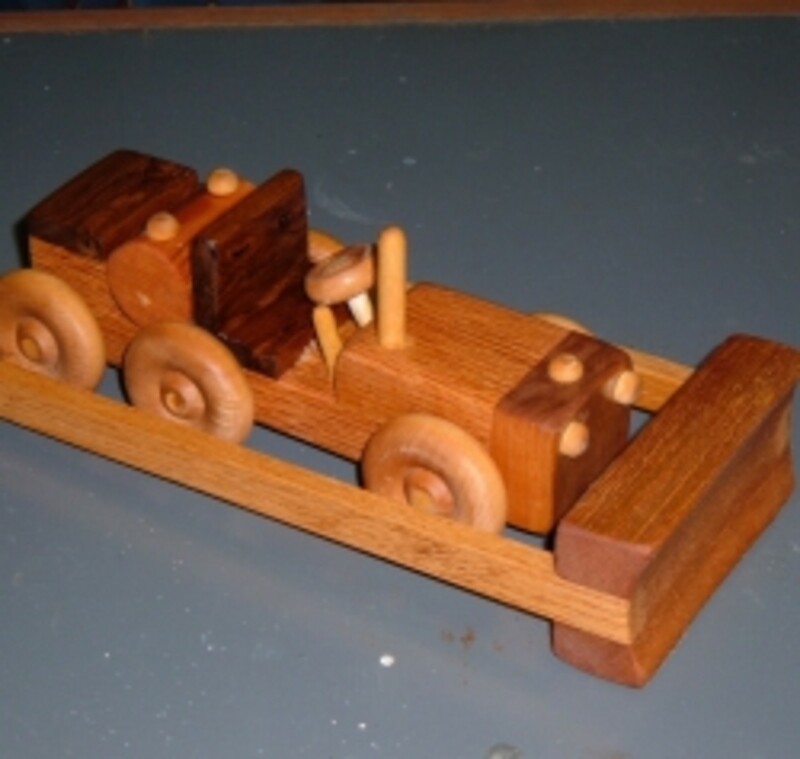 Have You Made Any Wooden Toys? Sure! I like making toys, puzzles and lots of other things from wood. Maybe not wood,but I like using other craft materials to make gifts and fun stuff. I'm more of a cook (or baker) and make lots of tasty treats. My passion is painting, illustrating or photography. I prefer to knit and sew. I'm not much for crafts, but I like to purchase handmade things to support local artists. Why make something when I get buy it from a store? Wooden Toys: Free Plans, Products and More! A selection of simple toys like whistles and yoyos, to advanced projects like a replica wooden stove or Dutch shuffleboard. Each project is shown in easy-to-follow instructions. A listing of free wooden toy plans, available for instant download as a PDF file. 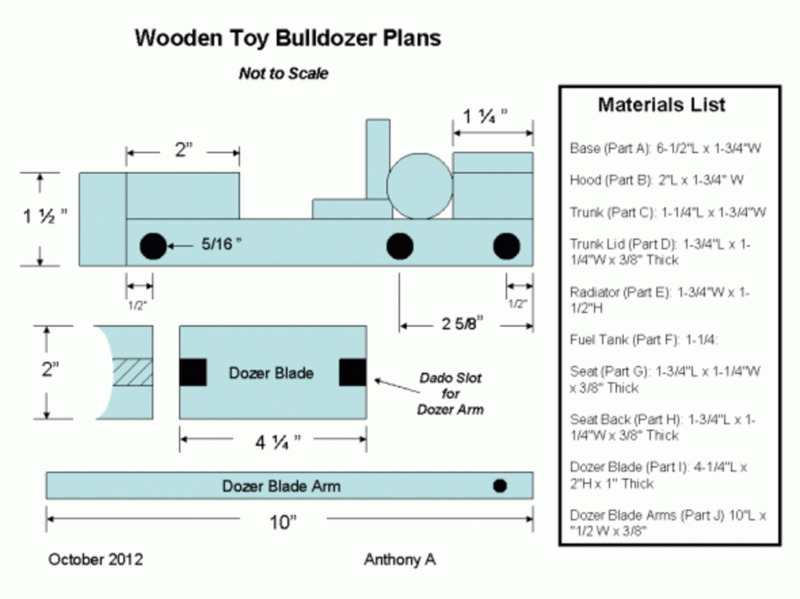 Wooden toy making plans help you make toys that are fun, fast & easy! Make your own SAFE toys with these fabulous and FREE plans to construct your own wooden toys!! AND there's something for just about every age group and interest. Unique, downloadable plans for wooden play things. 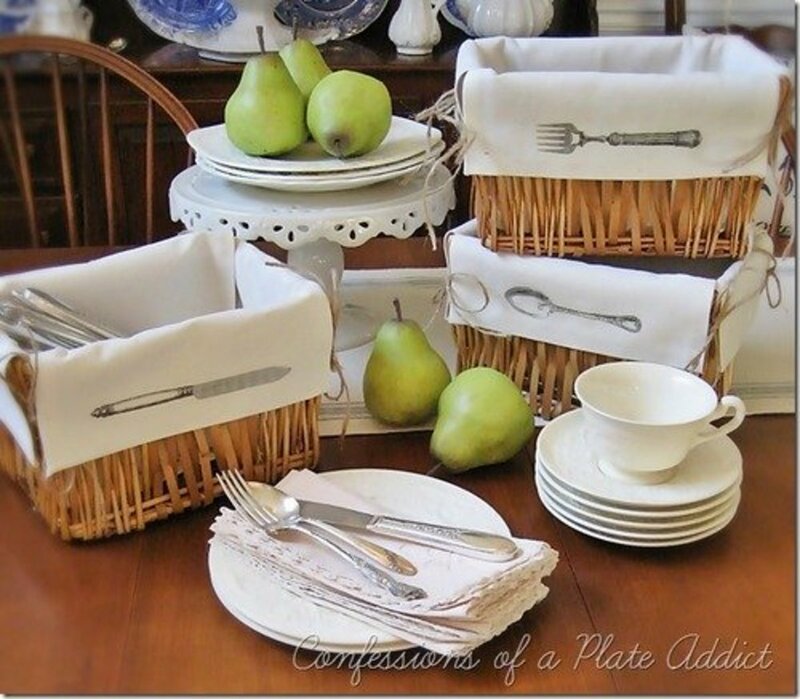 The web site features unique, downloadable plans for vintage-inspired wooden playthings. Every plan includes detailed step-by-step instructions, illustrations, and photos of the finished project. 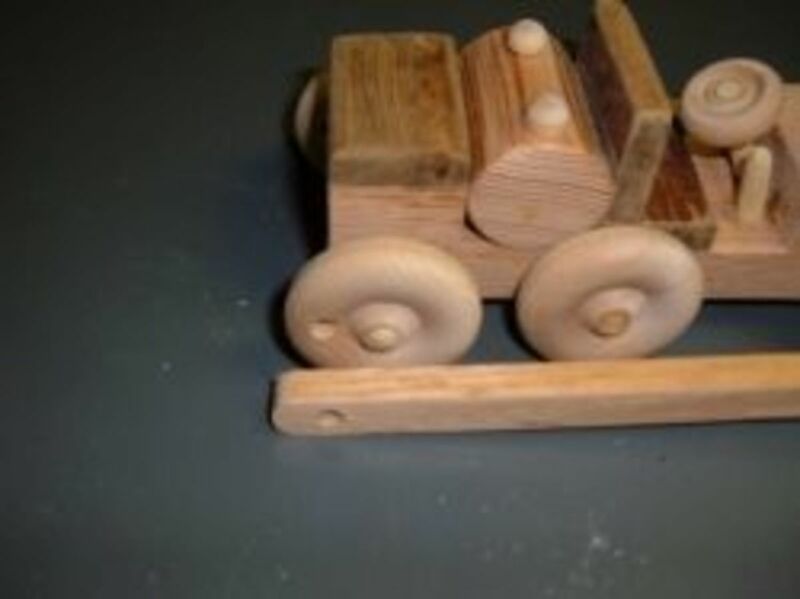 Wooden toy truck plans and patterns. 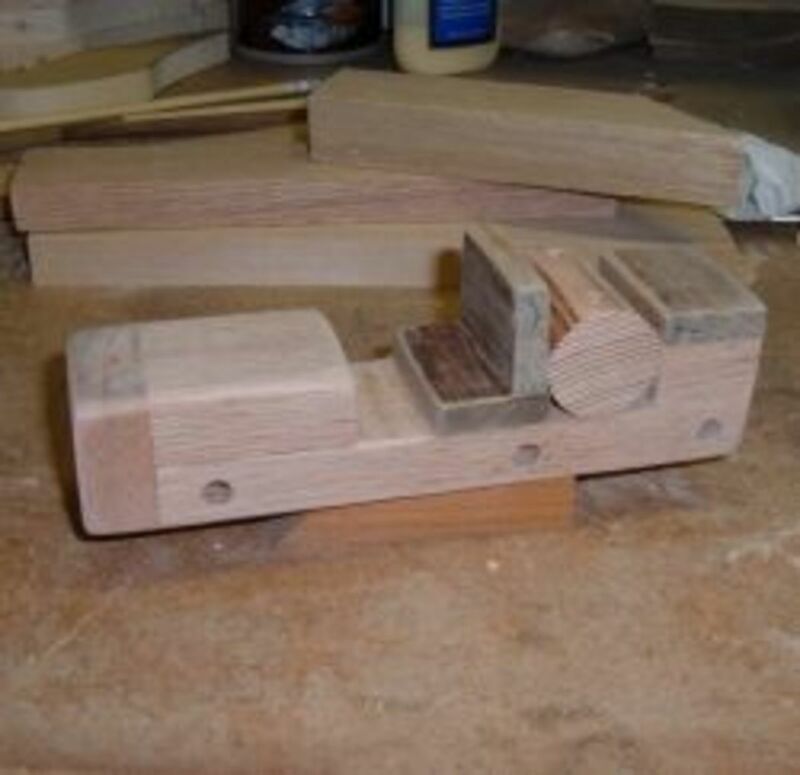 A listing of Wooden Toy Plans and woodworking resources. Easy to follow, step by step video showing the techniques and tools for making wooden toys. Your craftsmanship is amazing. I love this wooden toy bulldozer. 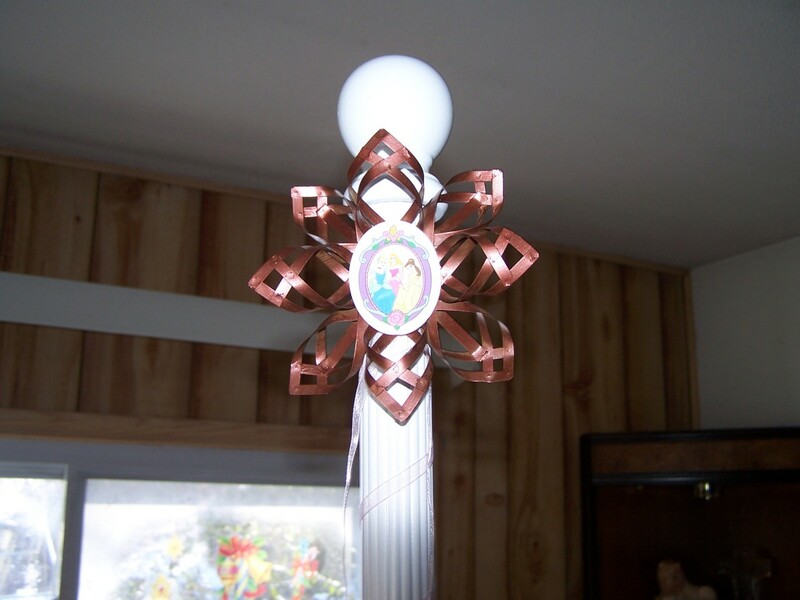 There is something so special about a handcrafted gift for a child or grandchild. These toys are true heirlooms. Thanks for the detailed instructions and process. Always outstanding... your work and presentation. So detailed and useful lens. I hope I could make a Wooden Toy for my son one day. Your wood toys really would make excellent Christmas gifts for kids. I think the natural wood toys are just as popular today as in years gone by - perhaps even more so. Wishing you and your family the very brightest of holiday seasons. Anthony, this is an absolute treat! 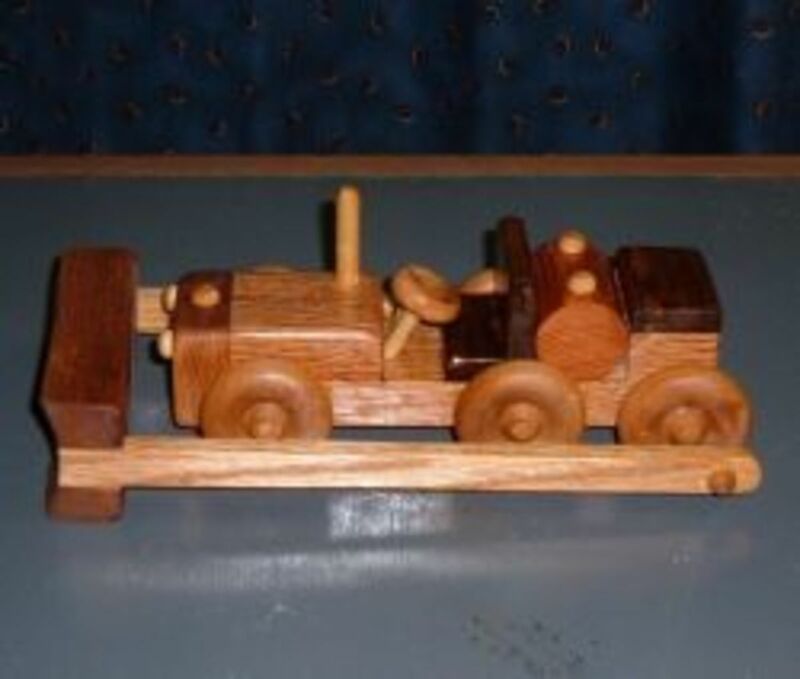 You wet our appetite to get started on making a wood bulldozer with great DIY instructions and then tantalize with a picture of your wonderful collection of hand crafted wood toys!